We have won-Lotto Players Say! Winning a lottery means your heart beat goes fast and your eyes reveal the excitement and fun. Many people play lottery but only few lucky are the winners. The greatest motivation that can draw you towards the winning point is reading the adventures and dreams of lotto winners. A retiree who purchased his Saturday Lotto entry in Coffs Harbour got quite a shock when he discovered he’d won a division one prize worth more than $316,000 in Saturday Lotto on 11 April 2015. For ten days, the registered winner was completely unaware he’d won a first division share in Saturday Lotto worth $316,393.49 because NSW Lotteries had been unable to get in contact with him. The winning 24-game QuickPick entry was purchased at The Plaza News, Shop 67 in Park Beach Plaza, 75 Park Beach Road in Coffs Harbour. Throughout Australia, there were thirteen entries that won a first division share of Saturday Lotto’s estimated $4 million division one prize pool on Saturday 11 April, each worth $316,393.49. Apart from the winning entry in New South Wales, there were five winning tickets purchased in Queensland, four were sold in Victoria, one in South Australia, and two in Western Australia. The winning numbers in Saturday Lotto draw 3519 on Saturday 11 April 2015 were 13, 21, 30, 3, 24 and 7 with the supplementary numbers of 27 and 4. A man in the Newcastle area couldn’t believe his ears that he had become one of the state’s newest millionaires after winning a first division prize of $1 million in Wednesday Lotto draw! The winner in his 50’s, who wishes to remain anonymous, was unaware of his millionaire status until a NSW Lotteries official was finally able to break the news to him late last week. He has been playing the same numbers for long. The winning 10-game marked entry was purchased from Wallsend Newsagency, 126 Nelson Street in Wallsend. There was one first division prize in Wednesday Lotto draw 3443, which offers a guaranteed division one prize of $1 million for up to four winners in each draw. A Sydney man in his forties scored a division one share worth $3 million on his Powerball entry. The winner, who wishes to remain anonymous, admitted to being a little nervous when a NSW Lotteries official contacted him this morning. The winning 24-game QuickPick entry was purchased from Ermington Newsagency, 2 Betty Cuthbert Avenue in Ermington. The winning numbers in Powerball draw 987 on 16 April 2015 were 29, 18, 6, 27, 8 and 25. The Powerball number was 2. A married couple from Perth’s northern suburbs scooped the entire $5 million Division 1 prize pool in OZ Lotto after purchasing their ticket from Padbury News and Post.. 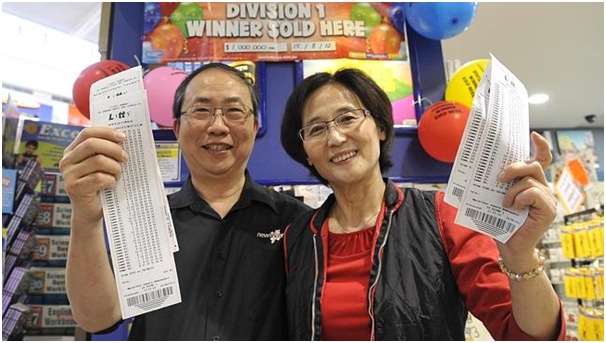 It was a last minute decision by the couple on the day of the draw to buy their winning ticket, which cost them only $7.20. The couple now plans for the multi-million dollar win in sharing it with family, travelling, new cars and a new home.